First-ever ultrasonic bird repellent for EXTERIOR USE! 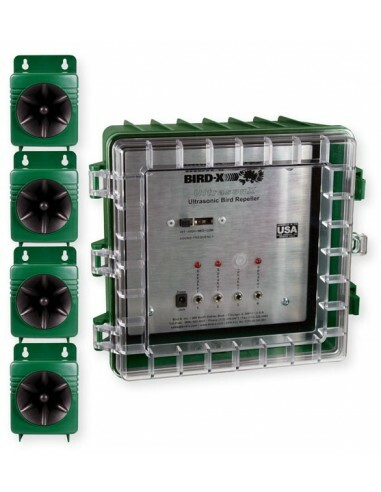 The Ultrason X is a high-quality ultrasonic bird repellent system. It is the world's FIRST ultrasonic repeller specifically designed for outdoor, year-round use. Ultrasonic means that it is "silent to humans", so you can effectively get rid of birds while maintaining a comfortable environment for your customers and employees. Most ultrasound only works indoors, but this device is powerful enough for use within medium-sized outdoor areas. This powerful sound attack forces bird pests to leave for good, yet it is harmless to the birds and the environment. Heavy-duty "surround sound". Separate control box plus four powerful directional speakers (each with 100' of wire) offer greatest all-around flexibility. ULTRASONIC SOUNDS guard your property all day and night, like a silent security guard. Sounds move from speaker to speaker, delivering a constant, menacing multi-bird defense. * Covers up to 3,600 sq. ft. 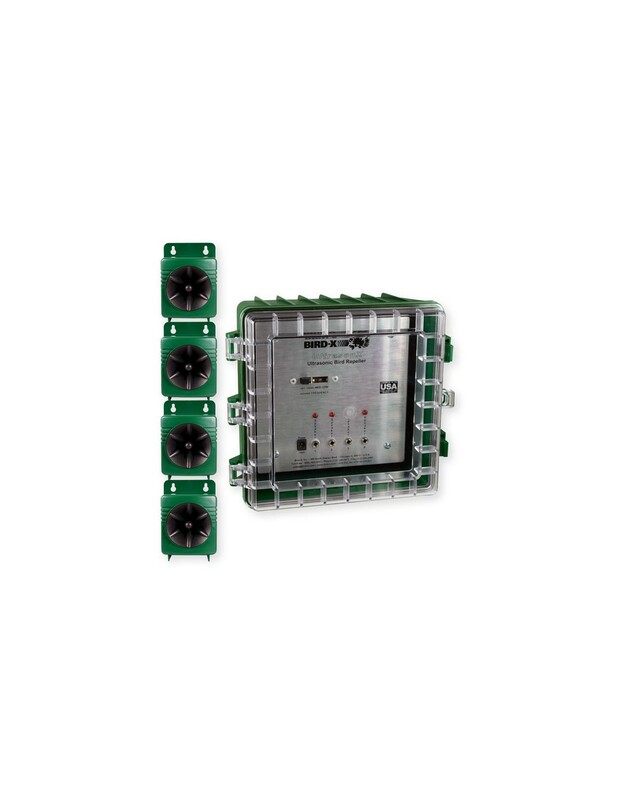 Programmable: High, Medium & Low frequencies plus variations offer a customizable solution. Electricity: 110vAC, adapter included. Electricity: 110vAC, adapter included.